For a family that cooks and cares about food as much as we do, it was unsettling to face our lack of Christmas dinner traditions. I could happily sit down to a meal of Tony’s grandmother’s lemon-parsley stuffing, Tony’s porcini mushroom gravy (lately infused with his late father’s 1981 port), and some cranberry sauce. Yes, it’s clear we have family foods, but not, like Lisa’s family, a traditional menu we anticipate each year. Well, who can blame him? And when I asked what he wanted for dinner, he listed stuffing and gravy, so that’s pretty much what we ate (oh, and some brussels sprouts and chard and caramelized onions and roast potatoes… but that’s another story). For dessert, I was planning just to offer up a plate of Christmas cookies, but this is where Eli had a specific idea: raspberry pie. No, but raspberry jam is always in season, and we even had some homemade jam made by a friend. Raspberry jam tart it was. I poked around online awhile and took most of my inspiration from David Lebovitz’s recipe but I had cold butter, not soft (and didn’t see the point in softening butter only to refrigerate the resulting tart dough until cold enough to use). So I pulled my Joy of Cooking off the shelf and followed Irma’s lead. I did borrow Lebovitz’s idea of reserving some of the dough to make an easy top crust, though instead of rolling it into a log, chilling and slicing it, as he does, I pressed mine flat and cut out some Christmasy stars. 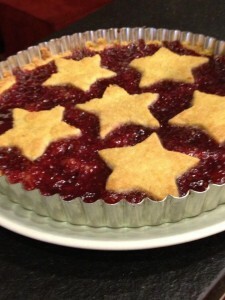 I predict you’ll see this tart on my table again at Valentine’s Day, topped with some hearts. This recipe makes enough dough for an 8″ tart (bottom crust and top decorations); if you have a bigger tart pan, it’s easy to scale up. Butter and flour the bottom of an 8″ tart pan with a removable bottom. Whisk the flour, sugar, salt, and lemon zest together in a bowl or in the food processor. Add the butter and work in with a fork or pulse in the food processor until the mixture makes coarse crumbs. Add the egg yolk and mix until the dough just starts to come together in a ball. Reserving about 1/3 cup of dough for the topping, pat most of the dough evenly into the bottom of the tart pan, letting it come up the sides a little bit. Spread with jam. Set aside momentarily while you make the topping. Taking the reserved dough, press or roll it out on a floured counter or between sheets of wax paper until it’s about 1/4″ thick. Cut into desired shapes, freehand or using cookie cutters. Arrange the shapes on top of the jam, sprinkle them with the coarse-grained sugar, and bake until the crust is golden and the jam is bubbling a bit, 20-25 minutes.